After Aurangzeb, there is a witness of Zinat-un-Nisa Begum, daughter of Aurangzeb, who built the Zinat-ul-Masjid in Daryaganj, Delhi which consisted of large courtyard above a number of rooms in the basement. The mosque had two gateways at opposite directions; the southern one serving as the main basement. This Masjid although was based on the architectural style of Jama Masjid, yet it failed to imitate the magnificence and coherence of the latter. Other specimens of this type of poor caricature of Mughal architecture are the Sunehri Masjid, built by Nawad Qudisya Begum in 1751, Safdar-Jung tomb of Delhi built by Mirza Muquim Abdul Mansoor Khan etc. 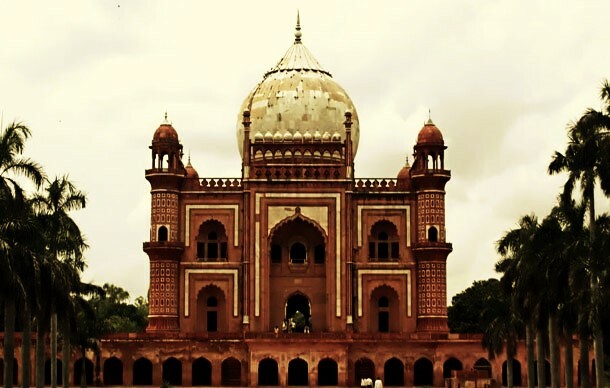 During the later half of the 18th century and the first half of the 19th century, a distinct form of architecture came into existence under the Nawabs of Avadh, whose first exposition was noticed in the form of Safdar Jung’s tomb, built in the honour of Safdar Jung (1739-1753), who was the nephew of the first Nawab of Avadh. • The City of Lucknow witnessed large building enterprises under Nawab Asaf-ud-Daula (1775-1795). • The most representative architectural achievement of this period is the Bara Imambara built by the Nawab in 1784. Absence of pillars in the main hall and simplicity of style and symmetry are its unique features. • On the western side of the Bara Immbara is the Rumi Darwaza in which ornamental designs radiate from the base to the top on both the sides in the most expressive manner. A 67-metre clock tower was built near the Rumi Darwaza in 1851. • The Chota Imambara or Husainabad Imambara, built by Muhammed Ali Shah as his tomb and the Shahnajaf Imambara, housing the tomb of Nawab Ghaziuddin Haider are other note-worthy buildings following this style of architecture. • Major General Claude Martin (1735-1800) built a large and pretentions building at Lucknow, then known as Constantia, which was one of the first large buildings of the European style built in North India. This building, which had several Palladian elements, set the tone for the development of a hybrid style of architecture in Lucknow depicting a degenerative combination of Mughal and Gothic styles. • The best examples of this style of architecture are the Chattar Manzil built by Nawab Naziruddin Haider and the keshar bagh built by Nawab Wajid Ali Shah between 1845 and 1850. The Chattar Manzil is an imposing building, whose main attractions are the underground rooms and a beautiful dome surrounded by a gilt umbrella. • The Kaiser Bagh is a quadrangular park with a baradari (pavilion) and yellow-coloured buildings on three sides. • The Roshanwali Koti and the Begum Koti at Hazaratgunj are other buildings where the Italian style is more prominent. In Punjab, a discrete style of architecture developed under the influence of the Mughal style. It was distinguished by certain primordial features like the multiplicity of chattris or kiosks, the use of fluted dome generally covered with copper or brass-gilt and enrichment of arches by numerous foliations. This architecture was best manifested in the construction of the Golden Temple at Amritsar in 1764 built by the fourth Sikh Guru Ramdas.